Women for Women International has launched a global mother t-shirt campaign #MotherTee to support and show solidarity with marginalised women in war torn countries. Global celebrities such as Meryl Streep and Angelina Jolie are supporters of the charity. 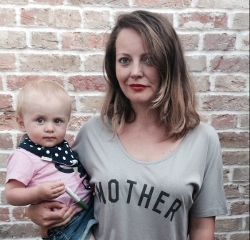 Closer to home tv and radio personalities such as Denise Van Outen, Fearne Cotton, Jo Wood and many other celebrity mothers have already donned their Mother tees and posted a selfie of themselves showing their support for the #MotherTee campaign. in war torn communities to create a better life for themselves, and their families. £15 from the sale of each #MotherTees t-shirt goes to help disadvantaged women around the globe. Already some of the profits from the #MotherTee campaign have gone to Action Aid’s Gaza Appeal, and all future profits will got to the Women for Women International charity.